Daniel James Bishton was born at Stafford on 23 April, 1897. 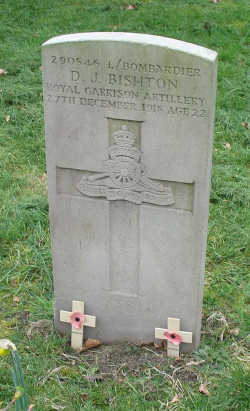 He was the son of Arthur Edgar Bishton, an engineer, and his wife Jessie. At some time after 1901 the family moved to Wheaton Aston where they lived in Bellhurst Lane - close to Arthur's parents who lived at The Hurst. After a short time working as a farm labourer, Daniel volunteered to join the Army in June, 1915. He was posted to the 38th Heavy Battery of the Royal Garrison Artillery and went to France with his Battery in March 1916. Daniel was injured by mustard gas on 26th January, 1918. He spent some time in hospital in France before rejoining his unit but he continued to suffer health problems arising from the gas and was eventually returned to England and sent to 1st Southern General Hospital at Edgbaston, Birmingham, where he died on 27th December 1918. Lance Bombardier Bishton, 290546, was awarded the Victory and British War Medals.